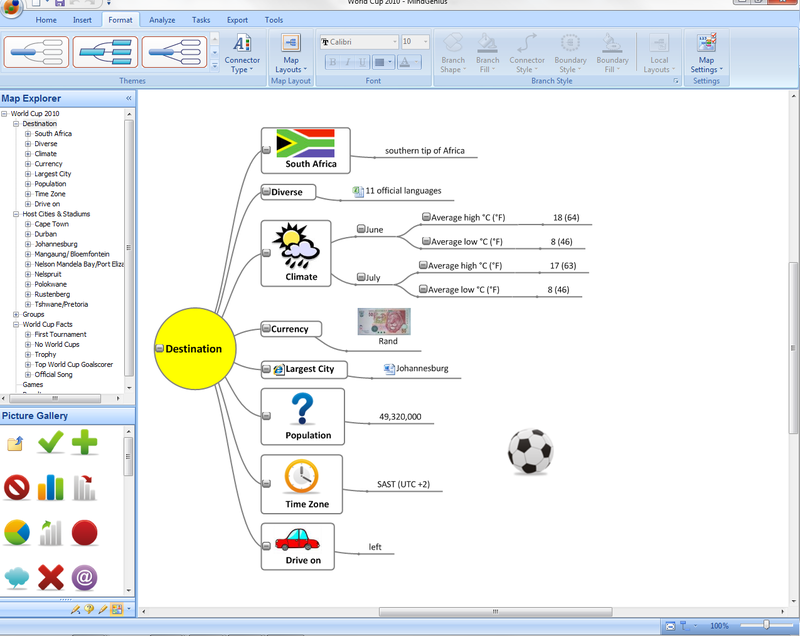 MindGenius are pleased to announce that Version 3.6 of their mind mapping software has now been released and is available to download. MindGenius 3.6 is free to all MindGenius Version 3 customers. As well as routine maintenance work, MindGenius Version 3.6 includes functional updates to the Gantt View and the addition of a file convertor which allows users to import data from Mind Manager and OPML formats. Click here for additional information on new functionality. MindGenius Version 2 customers can upgrade to Version 3 for just £117 /€ 135 /$ 188* for Business and £ 45/ € 52 /$ 72* for Education. *(& VAT where applicable) This offer is valid until August 30th 2010. Visit our website at www.mindgenius.com. MindGenius, a leading supplier of Business Information Mapping Software, have announced the growing adoption of their mind mapping software. MindGenius sales have achieved 3- fold growth from last year with as many as 100,000 licenses being sold in the first quarter of 2010. In total, the company has now sold software licenses to over 600,000 users, as both individuals and managers discover the easily learned power of MindGenius to fuel creative thinking, improve comprehension and buy-in, and drive better business results. In the first two quarters of 2010, MindGenius signed a series of large, global enterprise wide agreements representing thousands of software licenses for their V3.5 business software with major companies including PZ Cussons, Baker Hughes, Champion Technologies and Konica Minolta. 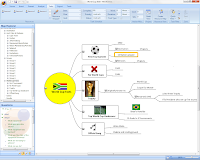 The MindGenius mind mapping tool helps companies to improve the quality and productivity of project planning and management, team collaboration and communications, business meetings and presentations, customer and sales interactions, brainstorming and content development. The interactive mapping software offers a transformative, but easily learned, way for organisations to change the way business professionals interact with information, ideas and each other to create innovation and change. Getting started with a research project can be a daunting task no matter what you are researching, particularly for those at school with limited, or no experience of undertaking research. With a multitude of varied sources to reference, it can be difficult to keep on top of it all. MindGenius can help students pull together information on any topic, and in this example, we have looked at how this could be applied to the World Cup. The World Cup is the most talked about topic of the moment and there are multiple sources of information from the official FIFA website, to multiple Wikipedia entries, fans blogs and other online articles, not to mention books and papers being produced on the subject. The problem with having many sources, is how to pull together all of the information. MindGenius allows you to quickly take down the key points of your information, and then link to additional sources such as web links, Word documents and PDF files. This allows you to have all information linked to and easily accessible from the one source. The ability to purely focus on key points means students will gain understanding on what the key points are of their topic, in a format that’s easy to understand. In this instance we have looked at things like groups, teams, South Africa as a destination, and World Cup facts. MindGenius has allowed me to break the information down by topic and you can see in the Map Explorer on the left hand side that all of my topics are listed here. Clicking on any title in here, automatically takes me to that branch, allowing me to focus in on that section. In the example below, I have selected “World Cup Facts” and I can focus in on that section either to review or add more information. To aid understanding further and to build a fuller picture, maps can be personalised by adding images, either from the MindGenius picture gallery or from other sources. This is of particular help when students need to report back on their project as a presentation, or remember it for tests or exams. This method of research can be done by individual students, or as a class activity. If you read the West Kent College article, you will see they use it in class by passing around a wireless keyboard and everyone adds their own ideas to an onscreen map. 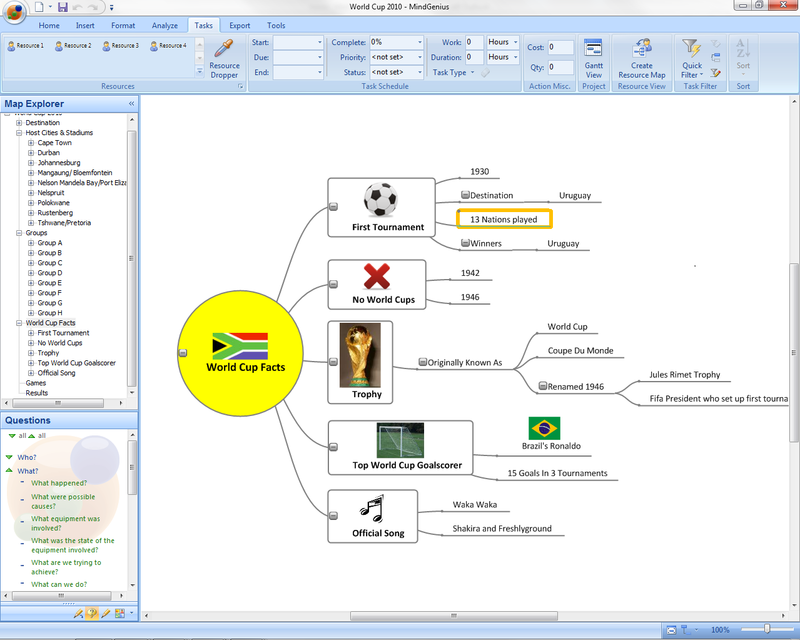 If you would like a copy of the map to get your class started on a project, or would just like to look at a few facts about the World Cup, please get in touch with us at info@mindgenius.com. David Carson is a Reader in Law and Behavioural Sciences at the Institute of Criminal Justice Studies, University of Portsmouth. He has been using MindGenius for 5 years. He uses it both in teaching and for research. He shows students ‘maps’ of legal topics, e.g. the law of theft. To be guilty the suspect must have (a) dishonestly, (b) appropriated, (c) property (d) belonging to another, (e) intending to permanently deprive the owner. Each of those requirements is a limb in a map. Further detail is then added to each of those limbs, for example the courts have decided you are only ‘dishonest’ if (a) reasonable people would have thought you were and, (b) you realised that. Again, each of those limbs is mapped and any further detail is added. David has, recently, begun to use MindGenius in his research. He is trying to show how the courts could make more reliable decisions on the evidence. If successful his work could both reduce miscarriages of justice and ensure more criminals are shown – proved beyond reasonable doubt – to be guilty. He is developing a technique known as Wigmorean Charting. This involves linking, or mapping, the evidence in a case. For example all the evidence which suggest the person charged with theft was ‘dishonest’ is linked to that legal requirement. Perhaps Witness 1 saw the suspect acting furtively and Witness 2 heard him tell a confederate that they were going to cheat the victim. These pieces of evidence are mapped – David is using MindGenius - into a chart. Evidence which supports other evidence, for example why Witness 2 is reliable and was not mistaken about what she heard the suspect say, is added to the appropriate branch. Evidence against guilt, for example an alibi, is also charted. MindGenius allows prosecution and defence evidence to be presented in different colours, shapes, etc. With a chart the evidence can be seen and rigorously analysed. ‘Weak spots,’ that is any point which needs to be proved but for which there is little or no evidence, will become clear. And MindGenius (unlike existing Wigmorean Charts), allows you only to display the branches you are interested in, as well as make electronic links to, for example, photographs or witness statements for easy access. David hopes that Senior Investigating Officers (the detectives in charge of serious crimes), will find them a more practical tool than the ‘policy logs’ they must currently keep to explain the decisions they made. They should also help the Crown Prosecution Service when they decide whether there is sufficient evidence to bring the case, and the judge when he or she encourages the lawyers to focus on the relevant issues in pre-trial hearings. They could also help jurors understand the case put before them. Police Professional, a weekly journal for police officers, recently published one of David’s papers on this topic (March 18, pp. 18-22). He is also promoting these developments through practical workshops on this and other topics (see: http://sites.google.com/site/dcccarson/). His ultimate ambition, he claims, is to make traditional law textbooks redundant, by replacing them with detailed mind maps! We are pleased to announce we are continuing the major development program we started with the release of Version 3 last year. Version 3.6, one of our regular maintenance releases, will be available from Monday 28th June and is free to all MindGenius Version 3 customers. The Gantt view has been extremely well received since its release in March. User feedback on the Gantt View regarding the timeline being fixed units has been addressed with the addition of the ability to set the timeline scale to an appropriate unit of time such as Quarters, Months, Weeks, Days and Hours, as well as a zoom facility to scale the Gantt view to match your overall project duration. In response to the number of organisations participating in a wholesale deployment of MindGenius to all desktops, we have developed the ability to be able to import maps from Mindjet’s MindManager. Any legacy maps held in the MindManager format can be seamlessly brought across into MindGenius and enable the entire organisation to move forward with MindGenius as the single map format, thus making the sharing of maps considerably easier. OPML (Outline Processor Markup Language) is an XML format for defining hierarchical data and is suitable for many different types of data lists and is used mainly to exchange data lists on the web. It is also used as a file format for certain iPhone/iPad applications such as MindNode & iThoughts. Simply select File \ Open to import any of these file types into MindGenius. This Import functionality has the ability to be extended to import from other sources and suggestions from our customers are very welcome. In last month’s edition of the More MindGenius newsletter, we looked at how the Dyslexia Department at West Kent College are using MindGenius as part of its site licence. This month we are looking at the Art and Media Department, and their Curriculum Leader Sarah Rogers. MindGenius is used in many different ways in the department, both by educators and learners, for improving note taking, collaborative learning, studying and presentations. In a traditional classroom setting, prior to MindGenius being installed, there would be a board and marker pens and students would take their own notes. Many of the students required help with the note taking process, and traditionally their notes would be very informal and often taken down on scraps of paper. Since the introduction of MindGenius they now work differently. Sarah uses MindGenius with her classes to facilitate collaborative learning sessions. She does this by passing around a wireless keyboard and getting class members to type their contribution, and add it to the map that is shown on a whiteboard or a screen at the front of the class. MindGenius helps Sarah, and other tutors, bring groups of students together and creates a useful visual focus for the class. At the end of the activity, all ideas have come from class members, with the teacher not having to contribute which helps to encourage peer to peer learning. This is then distributed to the students either as a map or a printed hand-out which gives all students a clear record of what’s gone on in class and each class member has access to good, relevant information on the topic they are discussing. This activity aids inclusion and every class member wants their copy of the map as they can see the benefit of using the map to prepare pieces of work such as essays. In fact, Sarah also works with her classes as a group, in a similar way to prepare essay frameworks. This is then exported to MS Word and emailed to students to use as their framework. The hand-outs are also ideal for homework. For project work, the classes start working in groups, without involvement from a tutor, and using the same process for gathering the information leads to a “snowball” effect where ideas quickly gain momentum and classes come up with far more ideas than they would have working in a traditional manner. For the students, MindGenius is a great information source as well as a good information carrier, ie what's been done in class can be sent by email to students, particularly those who may have missed the class. 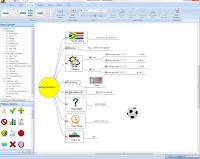 Sarah believes the presentation in map format is a much clearer way to work and helps build understanding, as well as this MindGenius is very visual and is not too technical for students to use. Some examples of topics they have worked on recently include comparison maps on independent films and mainstream films as well as research on copyright laws and the film noir movie “Women in the Big Heat” was analysed by the class in map format, in particular focusing in on the characters. They then had to present back on the film so the map was then exported to PowerPoint. MindGenius is used extensively by students for presentations, particularly by Key Skills Levels 2 and 3. As an end of term special, MindGenius are offering 20% off the price of a site licence for schools, colleges and universities. Simply contact us at info@mindgenius.com for further information. This offer is valid until 31st July 2010. Although the map explorer can handle a large amount of information and effectively allows you to maintain any number of maps within a map, you may have a preference to maintain your information as a collection of separate linked maps. It can also be useful when maintaining a project map that contains project notes, references, commentary on status, etc. as well as the tasks of the project. The tasks element can now be saved as a linked map which allows you to make full use of the Gantt feature without every other branch in the map being marked as an action. This branch and its children will now be removed from the map and make up the contents of the new map. The MindGenius 3 document icon will now be displayed in the branch allowing you to open your new map. Try also the ‘Save as map (current view)’ feature. This function respects the expand/collapse and filtered state of a map and has proved particularly effective at creating different maps from the same data, e.g. saving a map filtered to show only data relevant to a customer or saving a map filtered to show only ideas worthy of further evaluation.